Get the phone in rear panel view. Then see on the left-bottom side of the phone. 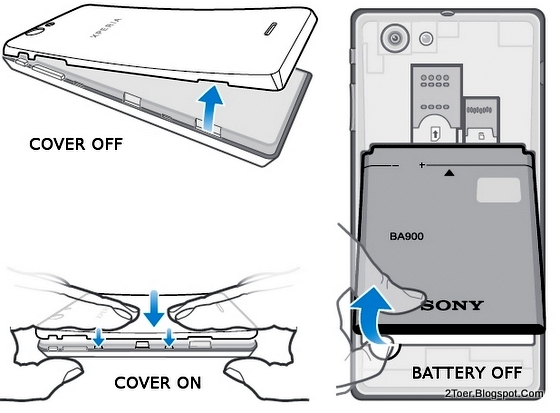 There is a opening gap that you can use to remove the back cover casing of Sony Xperia J. Just use your tip of finger (thumb / forefinger) then insert to the gap and firmly lift up the battery cover slowly. Remeber that the other hand must hold tightly the phone body but without grip the back cover. Whenever the left-side bottom cover is opened, then continue to detach the cover from side to side until it's fully removed. After you able to open the battery cover, now you can see that inside the cover, there are a sim card slot, a memory card slot and installed battery on its compartment. To be able on inserting the mini SIM card on its slot, and also inserting the external storage card, you need to remove the battery first. Removing the battery can be done just using your tip of forefinger to lift up the battery from its compartment at the opening cave at the bottom side of the compartment (pictured). Lift it and remove it. With gold-colored contact is facing down and the cut-edge of the sim card is placed in bottom-right position, you can just slide the sim card into its card slot until it reaches the end of the slot. You can do the same process for microSD card: slide the card to its slot with gold-contacts face down until it "locked". 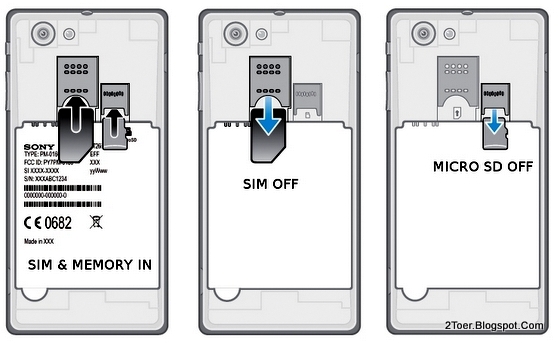 To remove the sim or microSD, you can do the opposite: use your tip of forefinger or thumb on to firmly "grip-slide" then slide it out from the slot. Remember before you remove the memory card, you must umount it first via storage settings and of course, you have to turn the phone off. Now you can assemble the battery back to its compartment, and then firmly reattach the back cover casing: align the back cover to the phone body side, then push it downward side to side until it firmly attached. You might hear a clack sound in the process. The Li-Ion battery on the Sony Xperia J uses 1750 mAh capacity. In which, the battery should be charged before you wanna turn the phone for the first time. It might that the battery has not enough power to give the Xperia J electricity, that why at least the battery need to be charged for about 30 to 60 minutes. Connect the USB cable on microUSB side to the Phone USB charging jack; connect the USB side to the Power Adapter; and finally plug the Adapter to Power Electricity Outlet. That how you can charge the battery of Xperia J in "normal" way. Alternatively, just connect it directly using USB cable to Laptop or PC. Although the charging time take longer than the "normal" way, but you still able to make the battery "charged". Green, Red and Orange LED Lamps would indicate the charging process. Whenever it Red, ASAP, you must charge the phone; whenever it Green, immediately remove the charger (means the battery is full); and the Orange is the level of the battery in "enough" position or it being charged. Now after you install the sim, assemble the battery, charge the battery and microsd (optional), it's time to turn it on for the first time. Just press and hold the power button available on the right side of the phone (pictured) until the phone vibrates (take about 2-3 seconds). Just wait and do the rest (may need to insert pin, choose default language, time etc). In case you got bored with Xperia J and wanna sell it to other person and change to the new phone that you like, it's better that you remove all the data and make the settings back to its factory original default. To do that just go to Settings > Backup & reset > Factory data reset > Reset phone > Erase everything. The Hard Reset (alternative name for Factory Reset) can be applied also to make you phone works normally like it original when you noticed that the Xperia J got freezes or the touchscreen stop responding too often. 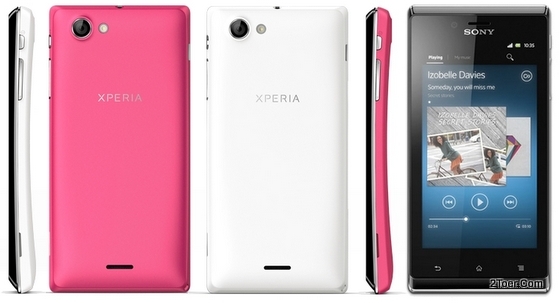 BTW, did you notice that the tutorial of the Sony Xperia J ST26i/ST26a we wrote above are almost the same with the tutorial for Xperia TX LT29i?